Savannah is fifteen years old and has been racing for three years. She recently won the 2007 Track Championship at Topgun Raceway in Fallon, Nevada. 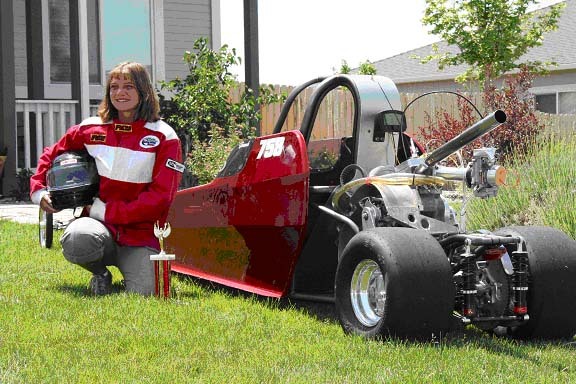 "I started racing in 2005 when my step-dad bought me a junior dragster for Christmas. When we got the car it was in pieces--literally. As the off season went on we slowly put the car back together and by March of 2005 I was ready to race. We took it to Fallon, Nevada, where my step-father raced, and I raced my car and won!" to buy some supplies for my step-fathers car. In the parking lot we met a man who would make my racing dreams a reality. His name was Bud Fizone and he had come there to get his niece a part for her car. His family and mine became friends and by August of the next year I was racing one of his top-of-the-line Visions Race Cars." "In July of 2007, I went to the Nationals in Denver with Bud's family and his car and learned tons from the people I met. I met Chris McGee, who built the motor I was running in my car. It was really cool to watch two professionals work on a car that was so complex it made my head spin. Right now I am getting ready for next season in which I hope to do better than I did this year."